Tennis players of Long Island, New York can rely on us for high quality, professionally installed sport courts! 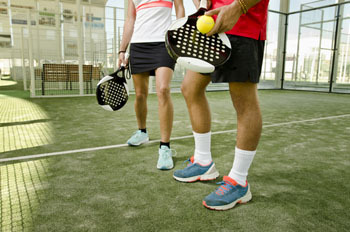 Similar to traditional tennis, paddle tennis is played with a depressurized ball and a solid paddle, as the name suggests, rather than a strung racquet. The courts are also smaller than a classic tennis court with a lower net and lack double lanes. To Flex Court Athletics, however, the size of the court doesn’t matter. We provide high quality paddle tennis courts throughout Long Island with built-in flexion, orthopedically designed to reduce stress on the body and stand up to heavy use. Our Long Island indoor tennis courts have consistently been rated best-in-class for their price-to-performance ratio, offering excellent traction for athletes while still being forgiving enough to reduce risk of injury. Our Long Island paddle tennis court surfaces are USTA and ITF approved and are endorsed Jonas Borkman, a U.S. Open doubles and Wimbledon champion. Rated medium-to-fast by the ITF (International Tennis Federation), our sport court surfaces are perfect for competitive and casual play alike at a country club, sports complex or even your own backyard. With a variety of colors available to suit your tastes or team colors and a 25-30 year life expectancy, we have every confidence you’ll absolutely love your new paddle tennis court. We even back it up with a 15-year warranty, so you can rest easy knowing that you’re taken care of. If you’re ready for our top quality courts, call Flex Court Athletics at (631) 753-0003 or contact us online today and get a FREE design consultation!